Bob Saxon, President of International Yacht Collection, sends in news of a $1 million price cut on Mark Elliott's central listing, the 25.6m motor yacht Acadia. Built by Lyman Morse in 2003 to a Ward Setzer design, this superyacht sleeps six guests in a master, double and two twins and her planing hull is capable of a 19 knot cruising speed. The pricing history of Acadia offers an interesting reflection on the state of the current market. In August 2009 she was reduced from $8.542 million to €5.9 million, followed by another cut to €5.6 million in July 2010. 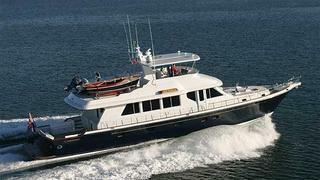 A year later, in July 2011 she came down to $4.9 million and now Acadia is asking $3.9 million. Something tells me she needs to go soon.